There can't be many battlefields that can be viewed from within the confines of an African Game Park - however, the field at Elandslaagte is one such place. The Nambiti Private Game Reserve is situated to the North East of Dundee in KwaZulu-Natal and represents a great place for a bit of recreation & relaxation for anyone touring the numerous battlefields in the immediate area. Elandslaagte was a rare outright British victory during the 1st phase of the 2nd Boer War. For the student of 20th Century military history it is particularly interesting because John French commanded the British Forces and one of his subordinate officers was Ian Hamilton. The former was to command the BEF in 1914 and the latter went on to lead the British & Commonwealth forces during the ill fated Gallipoli campaign a year later. On the day of the Battle of Talana Hill, two trainloads of British military stores were intercepted by a Boer force looking to cut the railway between Ladysmith and Dundee. The train was unloaded, prisoners taken and something of a party took place in the station compound. The next day, anticipating the arrival of a formidable number of British reinforcements, a mixed nationality Boer force numbering about 1,000 men (some with their sons) established themselves in a series of sangars on a 300 ft hill about 1.5 miles from the station. The British attack was executed as planned. The 1st Battalion, Devonshire Regiment would attack the hill with artillery support. The 1st Battalion, Manchester Regiment, 2nd battalion, Gordon Highlanders and dismounted cavalrymen of the Imperial Light Horse would turn the Boer left flank. Two squadrons of cavalry (5th Lancers and 5th Dragoons) would disrupt any Boer withdrawal. 1st Devons start point - Boer sangars to the front. The attack went in at about 15:30 on the 21st October with confidence and the Boers returned fire with deadly effect. Their rifles were supplemented by two artillery pieces. The attacking Devonshires had to traverse open ground and negotiate a barbed wire fence. Nevertheless they made the hills and despite a counter-attack lead by General Kock, resplendent in his Sunday best and top hat, the Boer defenders stated to withdraw. The attack on the left flank had been critical and the combined pressure on both flanks had tipped the balance. With the Boers streaming off the hill towards their camp at the rear, the cavalry were ordered forward. The spectacle of horsemen armed with lances riding through the fleeing Boers three times in succession was one that left a stark impression on the survivors. 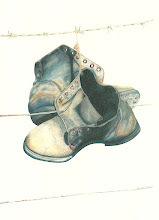 By this time rain had set in and by dusk the plain to the South of the station was littered with the Boer dead - including, according to Kenneth Griffith (author of 'Thank God We Kept the Flag Flying' London: Hutchinsons, 1974), family members who had travelled with their fathers or menfolk. Although a tactical victory for the British, the battle achieved little. French's surviving force fell back to Ladysmith - soon to be under siege, and the Boers reoccupied Elandslaagte three days later. The Times History of the War in South Africa gives 55 killed and 205 wounded for the British, and a slightly lower figure for the Boers. It is possible though that non combatant casualties were not included in the latter tally. For Winston Churchill and the Armoured Train (1899) click here. For the full photo set from our 2014 Walking the Battlefield Tour of KwaZulu-Natal click here.